*Mobile platform and the manipulator are controlled by the same controller. 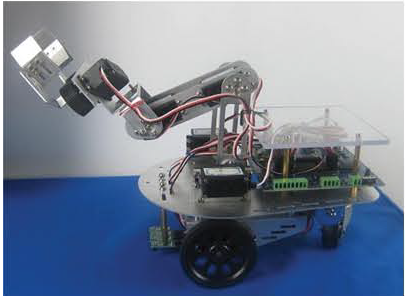 *The robot arm is driven by dual-motor. *A variety of mounting holes on the mobile platform’s mechanical parts is easy for expansion to install a variety of sensors. *High-power rechargeable lithium battery, long running time. *Supports USB cable to the integrated development environment, debugging and downloading programs. *Has a Xbee module expansion interface. *Support a variety of programming environments, such as: Arduino IDE, Eclipse, AVRProjectIDE etc.